My little sister recently suggested I do another Chili post; my last was White Bean and Chicken Chili, posted in 2011. I confessed to her that I couldn’t and somewhat shamefacedly (is that a word) admitted it was because I like this simple Chili we grew up with best, and I didn’t think anyone would be interested in it. It’s nothing fancy, nothing trendy, it’s made with beans and ground beef, tomatoes and spices. 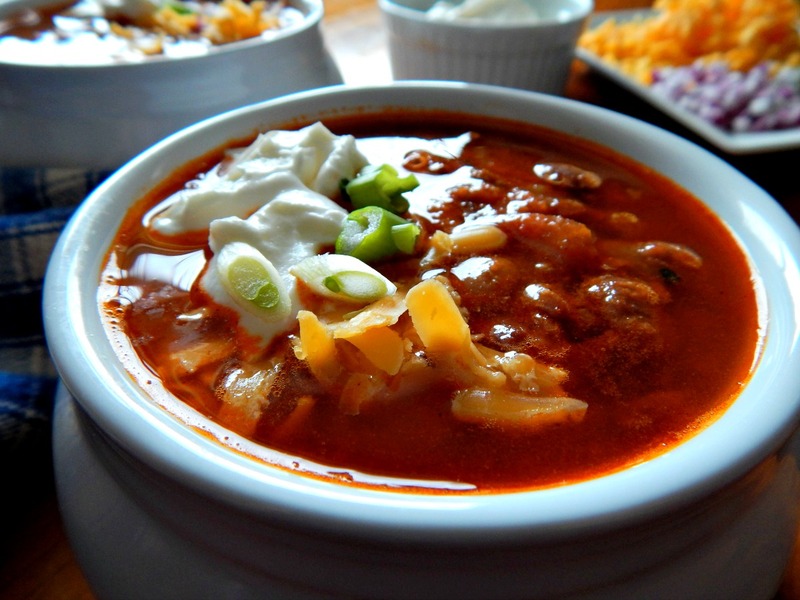 It’s considered in culinary circles and by chili aficionados to be a rather inauthentic dish. My sister, though, surprised me by her vehemence when she said she liked it best, too! The following week I ran into a young lady puzzling over cans of tomatoes in store, consulting with her boyfriend on her I Phone. Turns out she was making her (long passed on) Grandma’s Chili recipe to surprise her Dad, who had been craving it for years. They were concerned, never having had this type of chili that it was too thin and were trying to figure out how to fix it. We went over her recipe, which was almost exactly like my Mother’s. She just needed to simmer it longer. So here’s the recipe my Mom used, a recipe I’m sure was passed around and turned out by many of her generation, and this is how I make it for my family – but I use Pintos rather than Kidney beans. I always double this and use dried beans for economy’s sake, although one can use canned beans, instead. One package of beans (a pound) is too much, so I soak and cook the whole package and put about 1 1/2 cups of the beans in the chili and store the rest in two ziplocs with about 1 1/2 cups of beans, each, in the freezer for a later use. This Chili is generally served with plain old saltines, although corn bread would be good. Add toppings as desired, which my kids love, although my sister and I had never heard of such a thing when we were young! This recipe cost me well under $5.00 to make – see Strategies Applied, below. 15 to 16 ounce can kidney beans, rinsed and drained, equivalent of 1/3 pound of dried, about one and a half cups, cooked. I substitute Pinto beans. While this is cooking, bread up the tomatoes by hand, squishing them. If the top portion, near the stem is hard and unpalatable, remove. Add all the remaining ingredients, including tomatoes to the pan, bring to a boil, reduce heat and simmer, uncovered until the sauce is thickened to desired consistency, about three hours (traditionally this chili is served on the thin side.) If desired, add one can of kidney beans just before serving. note: I often use about a cup and a half of water so it doesn’t need to simmer for quite as long. A good, long simmer is important to meld all the flavors, but three hours, in my mind seems rather excessive. I’ll generally simmer it for an hour and a half or so, give or take, maybe two. I also normally double this – If I’m cooking for so long, it seems a shame to make just one recipe’s worth. Better the next day, this recipe also freezes very well. This recipe, can of course, be varied any way you’d like, but like many old fashioned dishes, too many changes may cause them to lose their charm. I’d actually suggest if you’re looking for another type of chili recipe, to start with another chili rather than attempting to modify this recipe into something it’s not. A few minor changes may easily be made, like substituting the ground beef for cubes, poblanos for the bell pepper, which would make this a bit more authentic while still keeping in the spirit of the original. This entry was posted in Click here for Bargain Meals, Click here for Fabulous Food Posts and tagged Beans, Bell Peppers, canned tomatoes, Chili, Dried Beans, Family Recipe, Freezes Well, Ground Beef, Heritage Recipe, Mexican or Southwestern, Soup. Bookmark the permalink. I love your comment that good is good enough. I still make the same chili I grew up with; very much the same recipe you shared. My kids enjoy some fresh parmesan on it, or a sprinkle of cheddar. I baked a lot of bread when they were all home, so their favorite with chili is cinnamon rolls. Yes, just like the school lunches! Don’t be afraid to post some of the good old standards. As you said, there is always someone out there trying to find them! It sounds like you have some pretty lucky kids! If you look on the tags to the left of my posts, you’ll see two tags that might interest you. One is Family Recipes, which are posts of some of the favorites Mom or Grandma made and handed down. The other is Heritage Recipes, which are recipes that have been around for generations, but aren’t necessarily from MY heritage. I’ll keep slowly adding over time, and please let me know if you’d like me to add any of YOUR favorites or have any suggestions!